Five other defendants in the Sousse case were handed jail terms ranging from six months to six years, while 17 were acquitted. 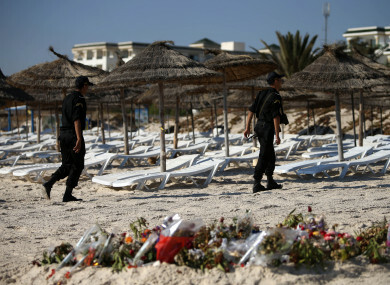 Police officers patrol the beach in Sousse, Tunisia, where 38 people lost their lives after a gunman stormed the beach. A TUNISIAN COURT has sentenced seven jihadists to life in prison over attacks at a museum and on a beach in 2015 that killed 60 people, three of whom were Irish tourists, prosecutors said today. Three Irish people were killed in the attack on the beach on 26 June 2015: Lorna Carty (54) from Co Meath; and Laurence (56) and Martina Hayes (55) from Athlone, Co Westmeath. Investigations showed one of the gunmen, Yassine Laabidi – who was born in 1990 and was from a poor district near Tunis – had amphetamines in his body. “It was important for us to see, and especially to hear – to try to understand the role” of each defendant, said one French survivor. Arriving at the end of the process will help us to turn the page, even if we can never forget. “The trial allowed them – by organising the video conferencing and giving the floor to lawyers chosen by the victims – to finally be recognised as victims by the Tunisian state,” he said. Email “Four jihadists get life for deadly 2015 Tunisia beach attacks in which three Irish tourists died”. Feedback on “Four jihadists get life for deadly 2015 Tunisia beach attacks in which three Irish tourists died”.